Did you know that Bergen is surrounded by 7 mountains? 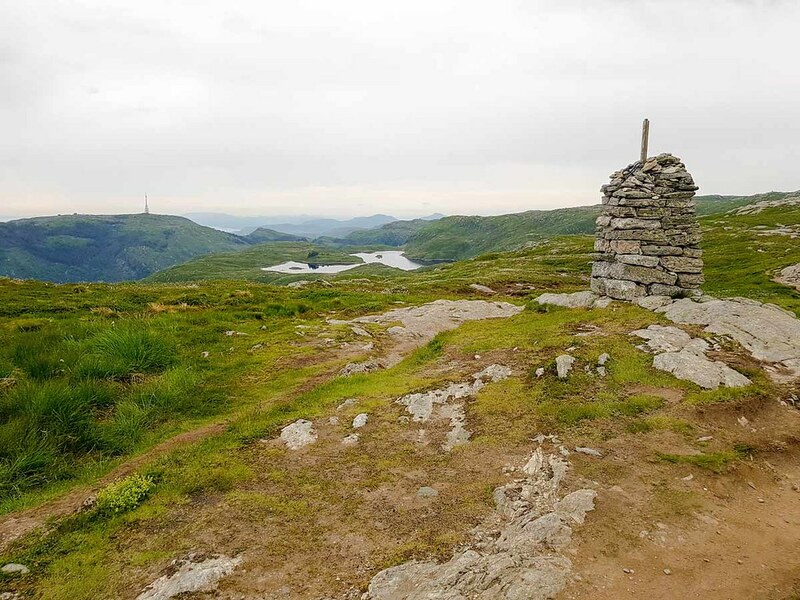 When I first visited Bergen, I didn’t imagine that years later I would return and do the hike from Mount Ulriken to Mount Floyen. Back then I took the funicular up Mount Floyen and walked around the forest for a bit, getting back to the city by foot. And I thought it was an exhausting trip! When I returned to Bergen, having already visited all the touristic places during the first visit, I decided to attempt the Vidden trail. How bad could it be? I planned to do it in the early afternoon, just after I checked in to my hotel. Being summer, I wasn’t worried about being in the mountains late, as the sun is up on the sky for most of the 24 hours of the day. Where to stay in Bergen? 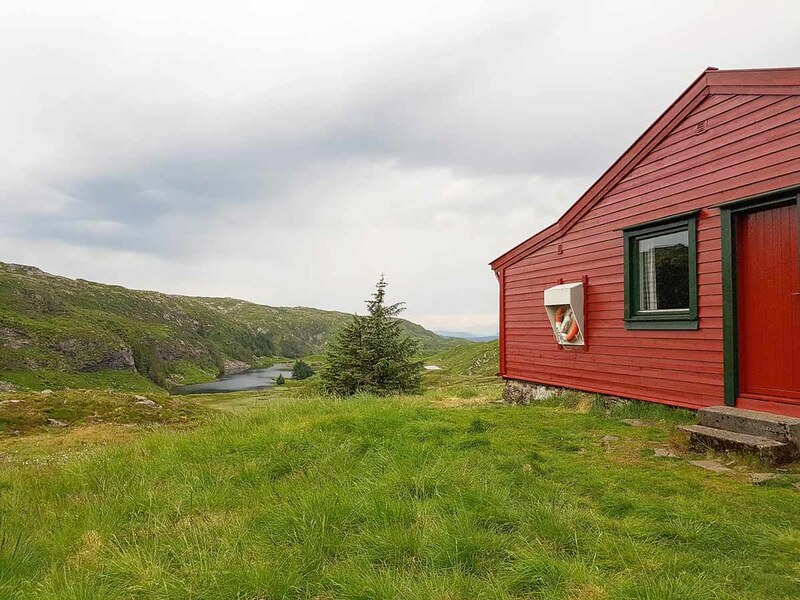 First thing you need to consider when you choose to travel to Bergen for hiking is to find accommodation. This can be very tricky because of how expensive the country is, so I will give you some recommendations. Another budget friendly hotel, with basic small rooms and free WiFi is City Apartment. Same as the P-Hotels, it is situated close to the park, in a residential building. Bare in mind that there is no elevator here. Prices start at 70 euros/night. This hotel is situated very close to the train station, making it a perfect choice if you have an early morning train towards the fjords. The rooms are modern and clean, with big beds. Prices start at 70 euros/night. This hotel’s location is next to Bryggen, the biggest touristic attraction in town. The rooms are decent sized and decorated in a traditional style, some of them having wooden beams supporting the ceiling. The hotel has a fitness centre and an underground parking as well. Prices start from 86 euros/night. Located very close to the harbour and offering WiFi included in the price, this hotel is raved by its guests because of the rich breakfast it offers. Some of the rooms have views over the street, some over the main square. They are not very big but are modern furnished and have everything you need for a comfortable stay. Prices start at 100 euros/night. With a beautiful location, right besides the historic Bryggen, The Radisson is a great choice of accommodation in Bergen. The price includes the breakfast and the free WiFi, as well as parking. The airport bus stops in front of the hotel as well. The rooms are spacious and offer beautiful views over the harbor. Prices start at 120 euros/night. Another great choice if you are searching for a 4 stars hotel is the Clarion Admiral, situated on the waterfront, offering large rooms with comfortable beds. The hotels also has a cosy restaurant where you can relax after a day of hiking. Breakfast and WiFi are included in the room rate. Prices start at 107 euros/night. If you are looking for a more cosy hotel, then Bergen Harbour is the right choice for you. It is situated between the funicular and the harbour. The room are small but modern, with comfortable beds and some of them with scenic views from the window. Guests are praising their high quality beds. Prices start at 140 euros/night. Read more about exploring the fjords near Bergen here. What do you need to know before attempting the Vidden Trail? This is a difficult hike and whilst Norwegians are jogging on it (!!!) it still requires a good amount of physical strength. It is an 18km long hike on top of a rocky plateau, with many ups and downs that can be a killer on your knees and ankles. Check the weather on the day you want to hike. Whilst when I started the day the weather looked on and the sky was relatively sunny, when I reached the mountain it started to rain. Make sure you are wearing proper clothes, a waterproof jacket and have a good pair of hiking boots, with a very good grip. Often you will find snow on top of the mountains, on the trail, and it’s advisable to wear the right outdoor clothing, especially knowing that in Bergen rains 240 days a year! The weather up the mountains can be unpredictable. You won’t be finishing the Vidden Trail earlier than 5 hours, so pack a lunch and plenty of water but also enough energy bars. You will need them. I started my hike from the centre of Bergen, The Fish Market as many know it, where I previously stopped for a quick lunch on the go. I highly recommend you explore the fish market as you will always find delicacies in here that you would probably not in your home country. My favourite was the “marinated salmon”, which means that the fish has been smoked whilst covered in condiments. From the Fish Market you can either walk to the Ulriken643 cable car or take the bus number #2 and get off at Haukeland Sjukehus S stop – see the bus schedule here (page 11). I chose to walk because I had to figure out how to best adjust my walking sticks and I needed a bit of practice with them, so I thought a bit of extra walk will not hurt me. I can’t stay I didn’t regret it later though. The cable car is a short walk from the hospital, where the bus will drop you off. The price for a one-way ticket is 110 NOK (70 NOK for children) and the journey lasts for about 15 minutes. 110 NOK is around £10. The views from going up are quite amazing, as you can see how the city gets smaller and smaller underneath your feet, and an entire panorama over the fjord opens up in front of your eyes. At the top you will find a small shop, your last chance to buy water or warm up with a hot chocolate before starting the trail. It is also your last chance of going to the loo and/or take a shower. 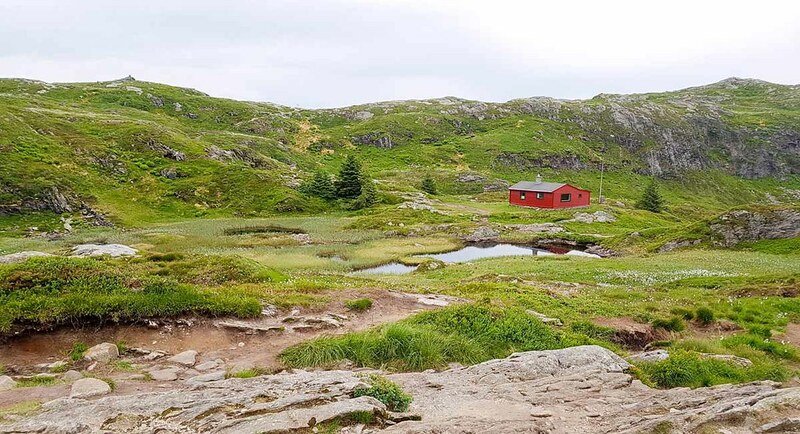 I was surprised to find that in the bathroom there was an actual shower, which is great if you do the hike the other way around (From Floyen to Ulriken) and want to refresh before going back down into town. From the cable car station you can gaze over the plateau which at this point doesn’t look challenging at all. Start the hike by following the Vidden sign. The trail is not very well signed but is marked by very large stacks of rocks, so if you spot them, you are on the right way. When I hiked I did meet quite a few people on the trail (remember I told you about the Norwegians jogging it?) and if you are in doubt if you are on the right way it’s better to ask. As I said, the first part of the hike is quite easy, but you do need good hiking shoes because the trail goes between rocks and boulders and it’s not flat. I was very happy that I brought walking sticks because they helped easing the pressure on my knees and ankles while going up and down on the rocks. After about an hour’s walk, you will reach a very steep area going down a ravine and then up again. I found this to be the most difficult part of the hike as it was quite tricky not to slip on the rocks. There wasn’t much to hold on to either. The views from the plateau are so beautiful that you will want to stop every 5 minutes to take photos. Don’t though as it will take forever to finish it. 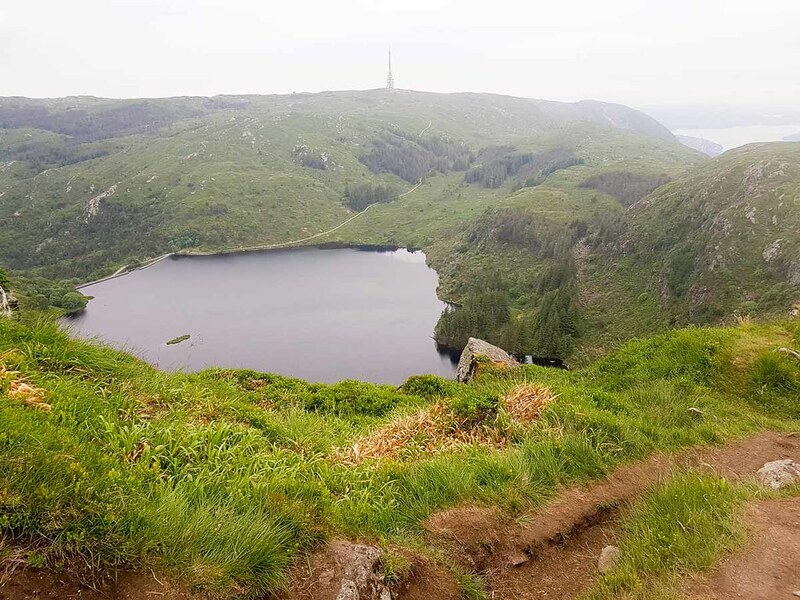 Halfway through, you will reach a lake, the fresh water reservoir of Bergen, where you will be able to fill up your almost empty by now bottle. The last part of the hike, from the electrical power station (I might be wrong on what it actually is, but you can’t miss it due to its tower which you can see at the horizon from the start of the trail) to Mount Floyen, is quite easy as it changes from an uneven path to a paved road. However, your feet will feel so tired that every step is going to be a challenge. The road is also heading down, so there is more pressure on your knees. 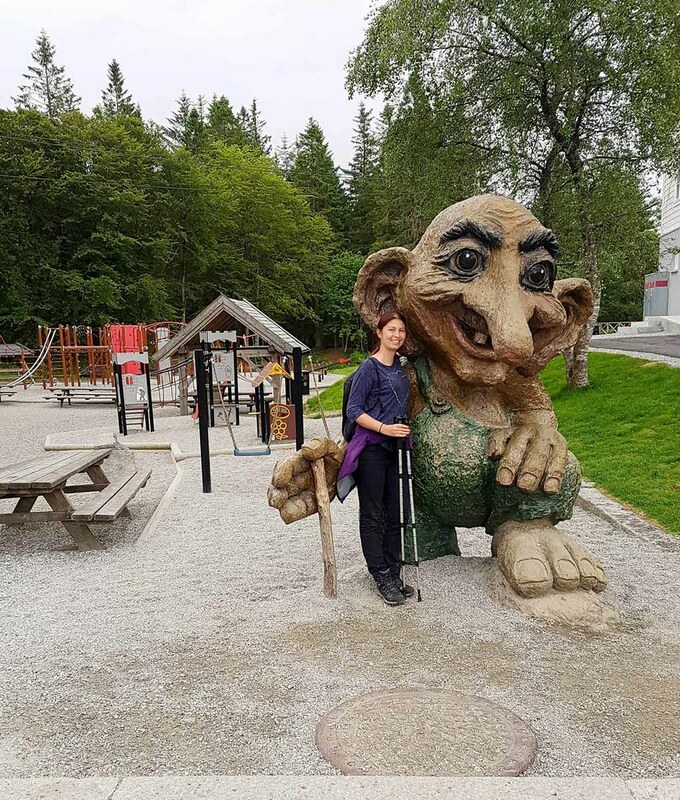 Once you reach Floyen you can stop for a break at the restaurant near the funicular and, if you have any more stamina left, goof around taking photos with the giant trolls scattered around the forest. At the beginning of the hike I was determined to walk all the way down into town, but I was so knackered, and my feet hurt so bad, that I chose to pay 45 NOK (£4) and take the funicular back. In 5 minutes I was back in town and in another 5 I was enjoying a well-deserved refreshing cold beer inside a coffee cup, in the first pub that came into my way. Why inside a coffee cup? Well, in Norway, pubs and bars are not allowed to serve alcoholic drinks on their outdoor terraces if these are on the pavement. If you are interested in other mountain challenges in Norway, check out the Kjerag hike, near Stavanger. 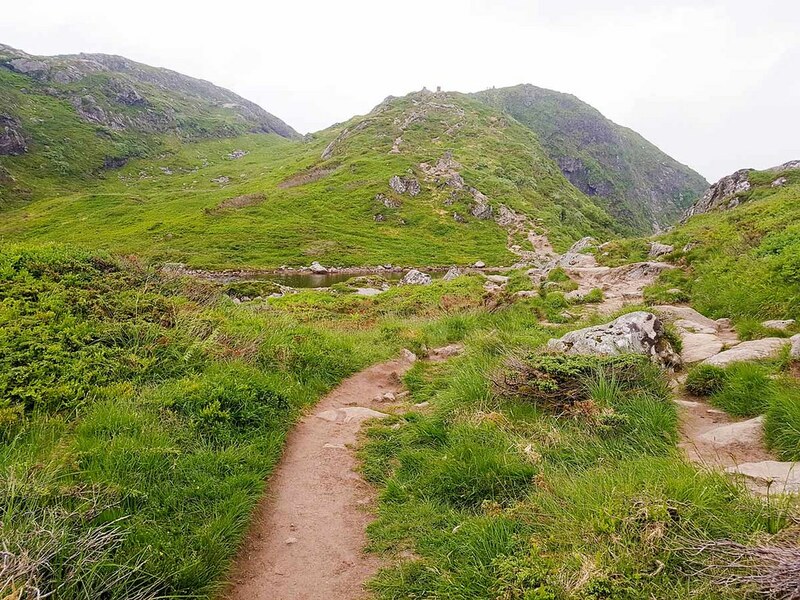 If you are looking to explore more of Bergen you can always choose to rent a mountain bike, go on a guided hike around Floyen Mountain or, if you are brave enough, attempt the via-ferrata route and ziplinne your way down the mountains. Disclaimer: Please note that this post has been written in collaboration with Simply Hike. Some of the links on this website are “affiliate links.” This means that if you click on the link and do a purchase, I will receive an affiliate commission at no extra cost for you. 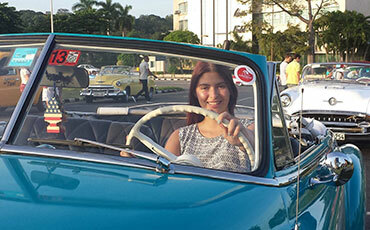 This helps me keep my website running and continue to share my traveling knowledge with you. I thank you for booking your flights or hotels using the links on my website. Regardless, I only recommend products or services I use personally and believe will add value to my readers. I love Bergen. My brother lives in Norway and we have explored Bergen but never been up round the surrounding mountains. That sounds like quite a walk. The views are stunning. Beautiful photos! I would love to do a similar route in the future. Hiking sure is becoming more of a hobby to me every year! I’ve always wanted to go to Norway! The hiking looks incredible. Once I read about the fish market I was hooked! Yum yum yum. Sounds like a fun walk…but mainly I want the salmon. When I did my study exchange n Oslo I remember being shocked at how apparently all Norwegians just jog everywhere. In the winter they cross country ski. In the town. And then as soon as the snow melts you see them running everywhere. Such fit people, I was feeling so lazy and ashamed in comparison! Beautiful photos. One of our favorite things to do while traveling is to get on some great hikes, and this one definitely looks like a worthwhile adventure. I’m starting to like hiking. 🙂 Still not huge fan, but your photos are amazing and very inspiring. Wow! That is quite the hike! My husband is one of those guys who jogs in steep hikes. I tell him to do the hikes at his pace and I will do them at my own pace. He will love to do this hike! Love this! We took the funicular up and down, but would love to try the hike someday. Great pics! Wow what a hike. We have never been to Norway and it does look absolutely beautiful!! I’d love to go there to hike!! WOW what an absolutely amazing place to look to hike, that is something I probably would have loved to have done once upon a time. I haven’t been to Bergen since I was a child (so quite a long time ago). Having rekindled our love of hiking in recent years, this looks like a great trip and an excuse to go back to that part of Norway. Hiking sounds so much fun and a great way to explore new places! I’ve never tried it but I would love to explore the UK’s national parks first. I don’t think you should be worried about not walking all the way down, you’re feet must have been so sore! WOW! Those views are incredible, I do love hiking, it makes me drift away into another world and relax! I also love exploring new places to this is going on my list of places to go! Great post! I love hiking, I don`t know why I almost never do it, and I have some really good trails around me… Your post just gave me inspiration to rescue my hiking boots from the bottom of my closet and venture myself in the mountains! Great advices, specially the one about waterproof clothes, it`s easy to forget that even if in the bottom of the mountain is sunny, the weather may not be so good once you get to the top! I did this hike in May and you aren’t wrong. This hike is HARD on your body. I also wore the wrong shoes. I bought these brown leather boots thinking they’d be good for the city and hiking… nope. My feet killed me so bad on this hike. I actually broke down and cried at one point. The views still made it worth it, but I’ll never forget this hike as being the hardest one i’ve done (to date). Thanks for sharing and letting me re-live the memories! I went to Bergen a few years ago but I have always wanted to go back and explore more. Hiking here would be ideal for me and I am definitely going to put this one onto my hiking bucketlist. The views look amazing and definitely looks like the hard work is worth it. I do like that you have broken down the accommodation that is a great tip. My fiance has some family living in Stavanger on Norway’s coast which we plan to visit someday. Everything I have seen or heard about Norway has always been so beautiful and this post confirms that again for me. As someone who loves hiking in nature, I really enjoyed reading this article but was surprised at the sheer number of rocks there. I just never thought it would be like that. Great that you had the poles though and I’m sure you loved the experience being in such a pretty place. All these greens are calling my name. 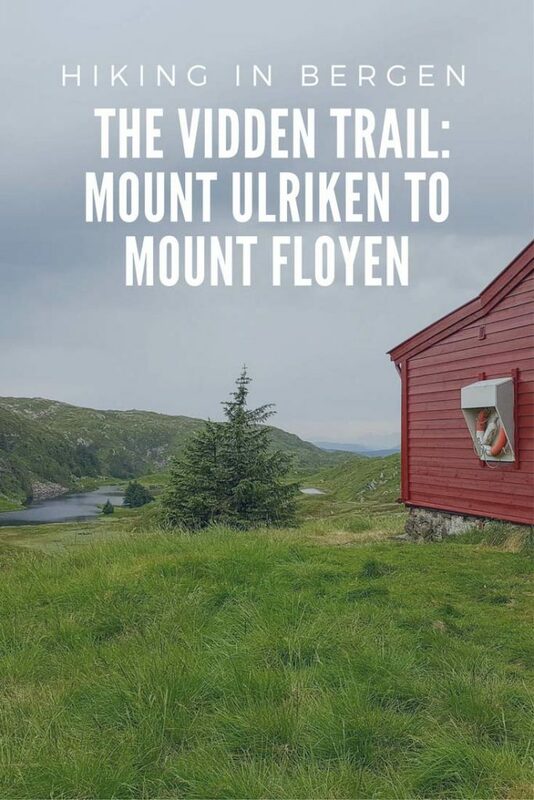 Bergen is spectacular and so is the Vidden Trail! I am no hiker but the view alone is making me want to go try this out for myself! Maybe soon I will! I recently did a little 5km hike and the inclines nearly killed me so I doubt I’ll be able to tackle a 18km hike! I’ve been up the funicular in Bergen but have never done this hike. It’s a wonderful little city and I’m sure I’ll be back in Norway soon, would love to do some hiking in fjord areas as well. Great post! What a wonderful, comprehensive guide. We went skiing in Norway a couple of years ago and absolutely loved it so I would love to go back in spring or summer. Gorgeous photos. My friend has just been to Norway and the photos she showed me were just stunning. I also have a friend that lives there, and I keep saying I will go visit. I’ve been saying that for 20 years sadly. Such a beautiful country to explore. The Vidden trail sounds challenging, but worth it. With the right footwear and determination, I’d be more than happy to take this on. Bergen seems so lovely, but so expensive at the same time. 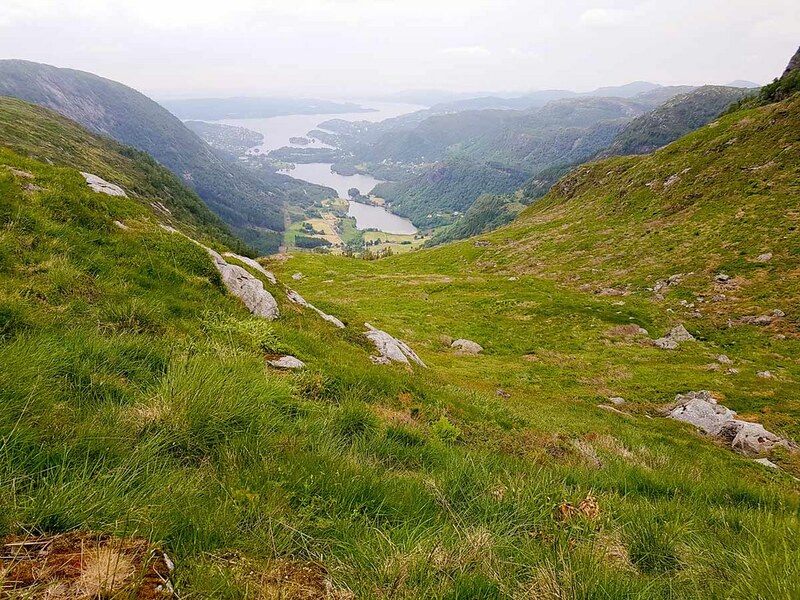 Still cannot believe that even a budget place like P-Hotels Bergen costs 54 Euros there… The view of the hike trail is so stunning! Thanks for the tip of bringing hiking shoes 🙂 They are really necessary for these activities! This sounds like a beautiful hike! Though a little strenuous as you describe descending into a ravine, I’d still hike it though! Also, love the little fact that your beer was served in a mug because you can’t drink alchol outdoors. Neat nugget! Beautiful photos, by the way! I am a huge hiking fan! And the Scandinavian countries look like a paradise for outdoor lovers! The greenery is just so lush, I could walk there for hours. Bergen is definitely getting higher on my bucket list! WHAT!!!! They jog the trail. I would be dead. A slow hike sounds way more fun and at least you get to appreciate all that beautiful scenery. The only Bergen I am familiar with is Bergen county in NJ—a fairly nice area but no where near as nice as what I’ve just read about. I hope I am able to visit one day. The views from this trail are absolutely amazing! Seems to be a worth-visiting destination! Thanks for sharing your experience. Norway is a top destination on my must see list! I swear you have visitors every places would you say this is your most favorite place? The view looks gorgeous on that trail. It looks like it was a really peaceful journey. What a long hike! Especially when you take all those hills and valleys into consideration, but with a view like that? Who wouldn’t want to. I’m surprised at how affordable the luxery hotels are! My boyfriend is desperate to go to Bergen, your pics have swung it for my. Stunning landscapes. The pictures are great and the hiking shoes are damn necessary! Bergen seems like a good place to visit, I hope I can visit someday. Thanks for sharing such an interesting post! What a fantastic trip! 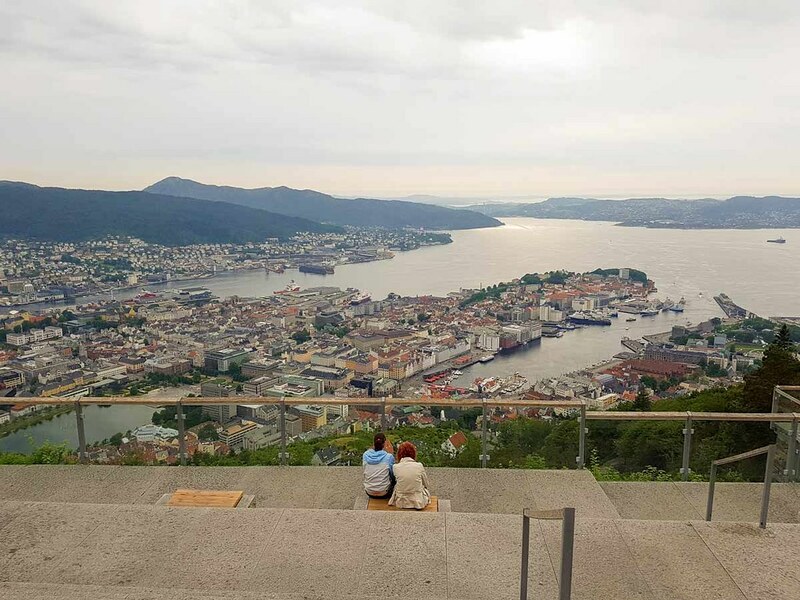 I never heard of Bergen before but it looks like a beautiful place to hike and the culture looks fun as well! I think one of the best parts would be the cost! The budget places you suggested aren’t bad at all! Wow, Bergen looks like such a gorgeous place to visit. I’ve never been to Norway – I think I might need to add it to my travel bucket list! Ah I recognise so much of this, having been in 2016. Looks like you definitely had better weather than us though! I didn’t know there are 7 mountains surrounding Bergen so will have to return to see more! Wow!! This is such an amazing place to visit. Lots of beautiful scenery. I will definitely add Bergen to my next travel visit this 2018. This was a very informative post! I love hiking, and this trip looks like something I would really enjoy. I would just have to prep physically and financially! Lol at the Norwegians jogging up the 18km trail–Europeans who live in the mountains always manage to make me feel out of shape! 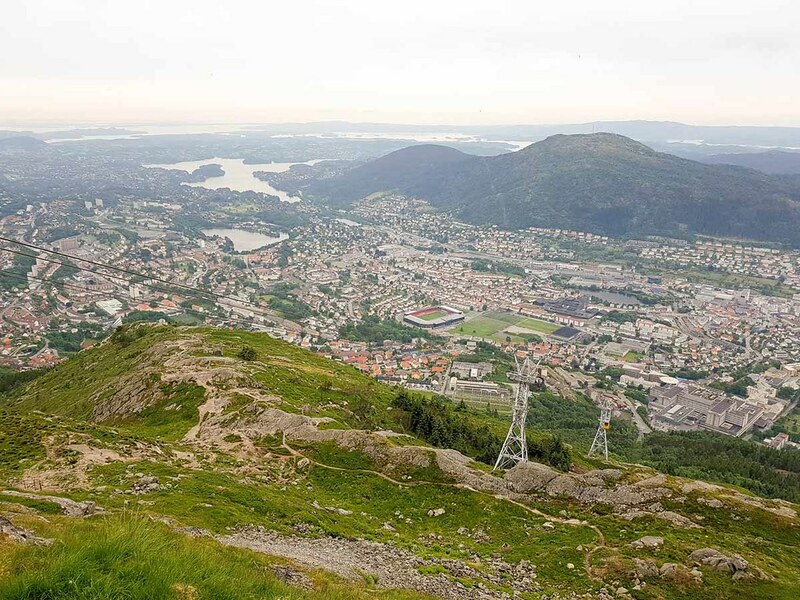 I would love, love, love to visit Bergen, and even more to go hiking in Norway–those views are just incredible! Would definitely need to pack hiking boots for that trip… and lots of coats! It looks beautiful here! Norway has always been on my list of places to visit. I love that you’ve managed to do all the tourist sights aswell as getting to explode the countries natural beauty! I couldn’t imagine jogging on a mountain trail! That really takes some dedication! Your pictures are wonderful & I like that you include where to stay for every budget. Looks awesome! Thanks for all of the info on Bergen. I think going down and back up through the Ravine would definitely be the hardest part for me. And I’ll tell you right now, I’m a big ol’ NO on the Via Ferrata. My friends did one in Switzerland while I drank coffee at a cafe. Once I saw their pictures I was pretty glad I didn’t do it! We’ll have to add Bergen to our list of places to visit. This looks like a beautiful place! I definitely don’t think I have the strength to hike or walk this. I really want to go to Norway now that I have learned a lot about it lately, so beautiful. This is my first time hearing about the trail but it is definitely something I could be doing! I am sure my bf would love it too! I have always wanted to visit Norway and this sounds amazing. The pictures are so beautiful. Norway is on my travel bucket list! Hikes are my favorite because you’ll never know what you’ll see and experience. I am planning to visit Bergen this 2018 with my daughter. Not to hike but to spend my twin’s birthday and to visit my longtime friend. I am looking forward to seeing those beautiful sceneries. Will put this on my travel lists. Hiking is such an amazing thing. One must have stamina because of the great strength required by this activity. I appreciate you for delivering such awesome information of Bergen to us. These pictures are lovely. I love hiking and this place looks amazing, very beautiful. I will have to put this on my list of places to visit some day. Thanks! I love Bergen. Did some little hikes there. Your post made me thinking about going back again. Your detailed information and pictures are awesome. Thanks for sharing! Great post! I also did this hike last may and you were SPOT ON about the Norwegians jogging this thing.. I actually wrote my own post all about it, more memoir style. It was the hardest hike I’ve ever had to do and I wasn’t mentally prepared for it because the website service we bought our tickets through said it was “family friendly”. It’s beautiful, but I wouldn’t recommend it to anyone who isn’t an experienced hiker. You CAN just go up to Mt. Floyen or Mt. Ulriken and see the beautiful view, maybe walk a mile or two in and have a picnic, but the whole thing was a lot. I should preface this with: I’m used to hiking 6 miles MAX at a time. And I hike the moderate trails of the bay area where the elevation gain is maybe 1000 ft or less.